The fundamental item of diving equipment used by divers is underwater breathing apparatus, such as scuba equipment, and surface supplied diving equipment, but there are other important pieces of equipment that make diving safer, more convenient or more efficient. Diving equipment used by recreational scuba divers is mostly personal equipment carried by the diver, but professional divers, particularly when operating in the surface supplied or saturation mode, use a large amount of support equipment not carried by the diver. Equipment which is used for underwater work or other activities which is not directly related to the activity of diving, or which has not been designed or modified specifically for underwater use by divers is excluded. 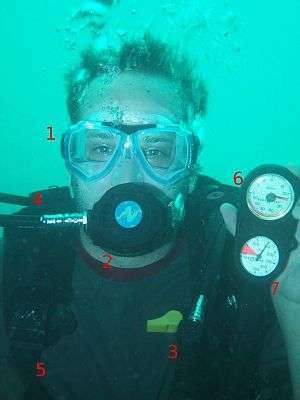 Surface oriented surface supplied diving (Bounce diving), where the diver starts and finished the dive at normal atmospheric pressure. 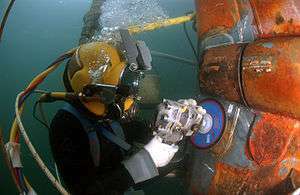 Saturation diving, where the diver remains under pressure in an underwater habitat or saturation spread between underwater excursions. 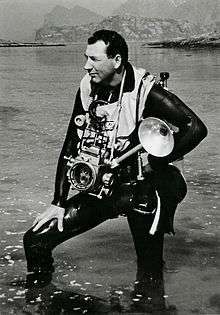 Standard diving dress - mostly used in professional diving. Mainly of historical interest now. "Compressor diving" - a rudimentary form of surface supplied diving used in the Philippines by artisanal fishermen. 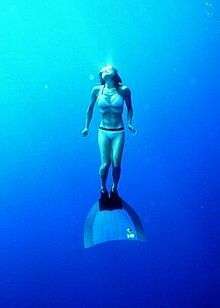 Free diving or breathhold diving, where the diver completes the dive on a single breath of air taken at the surface before the dive. Snorkel allows breathing at the surface with the face submerged, and is used as an adjunct to free diving and scuba. 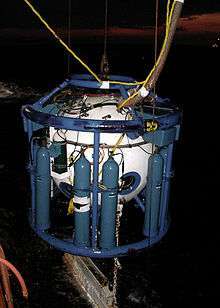 Atmospheric diving suits and other submersibles which isolate the diver from the ambient environment. These are not considered here. Liquid breathing systems are extremely rare and at an early experimental stage. It is hoped that some day practical systems allow very deep diving. This is not considered here. The Newtsuit is an atmospheric diving suit which has fully articulated rotary joints in the arms and legs. Scuba equipment: Primary cylinder(s), carried back-mounted or side mounted and open circuit regulator(s), or rebreather sets. 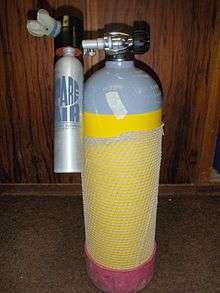 Alternative air source such as bailout bottle or pony bottle, and decompression cylinders and their associated regulators. Secondary demand valve (Octopus). Surface supplied equipment: Helmet or full face mask, diver's umbilical, airline, bailout block, bailout cylinder and regulator. 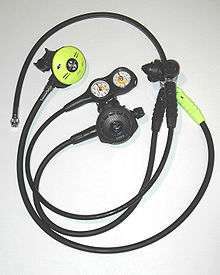 Scuba regulator: First stage with primary and secondary demand valves, submersible pressure gauge and low pressure hose for BC inflation. Thermal, sting and abrasion protection. In cold water, a diving suit such as a dry suit (at temperatures of 0-10 °C), a wet suit (at temperatures of 21-25 °C), or a Hot water suit (surface supplied diving only) is necessary. In very warm water (temperatures of 26-30 °C), many types of tough, long, everyday clothing provide protection, as well as purpose made garments such as dive skins (made of lycra) and shorty wetsuits. In some cases, simple regular swimsuits are also used. Diving boots - With dry suits, the boots are usually integrated. 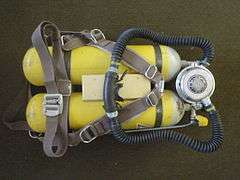 A backplate is a structure onto which the back-mounted diving cylinders are mounted, usually linking the buoyancy compensator with the weight of the diving cylinders and provided with a harness of straps which secures the scuba set to the diver's back. 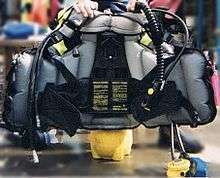 A backplate is generally used with a back inflation (wing) type buoyancy compensator, but can also be used without any buoyancy compensator. Buoyancy compensator, also known as Buoyancy Control Device, BCD or BC - is usually a back mounted or sleeveless jacket style device which includes an inflatable bladder used to adjust the buoyancy of the diver under water, and provide positive buoyancy at the surface. The buoyancy compensator is usually an integral part of the harness system used to secure the scuba set to the diver. The earlier collar style buoyancy compensator is seldom used any more. Pneumofathometer is the surface supplied diving depth gauge which displays the depth of the diver at the surface control panel. Dive Computer helps the diver to avoid decompression sickness by indicating the decompression stops needed for the dive profile. 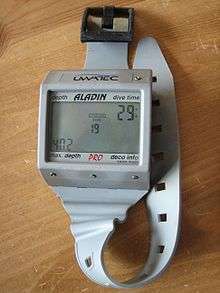 Most dive computers also indicate depth, time and ascent rate. Some also indicate oxygen toxicity exposure and water temperature. 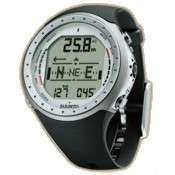 Diving watch is used with depth gauge for decompression monitoring when using decompression tables. 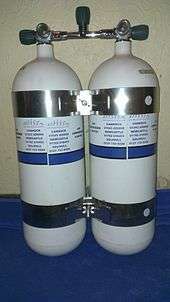 Submersible pressure gauge, also known as a "contents gauge" is used to monitor the remaining breathing gas supply in scuba cylinders. 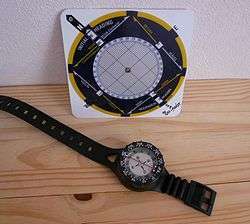 Distance line or "come-home-line" can used to guide the diver back to the start point and safety in poor visibility. A cave line is a line laid by a diver while penetrating a cave to ensure that the way out is known. Permanent cave lines are marked with line markers at all junctions, indicating the direction along the line toward the nearest exit. Mask allows the diver to see clearly underwater and protects the eyes. Full face mask protects the face from dirty or cold water and increases safety by securing the gas supply to the diver's face. If it contains no mouthpiece, the diver can talk allowing the use of communications equipment. 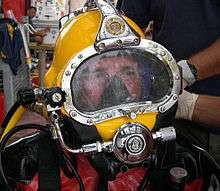 Diving helmets are often used with surface supplied diving. They provide the same benefits as the full face mask but provide a very secure connection of the gas supply to the diver and additionally protect the head. Underwater writing slates and pencils are used to transport pre-dive plans underwater, to record facts whilst underwater and to aid communication with other divers. 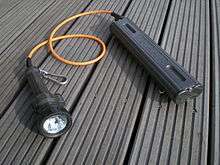 Torches or flashlights are essential for safety in low visibility or dark environments such as night diving and wreck and cave penetration. They are useful for communication and signalling both underwater and on the surface at night. Divers need artificial light even in shallow and clear water to reveal the red end of the spectrum of light which is absorbed as it travels through water. Hand-held sonar for a diver. A diving half mask provides clear sight and protection for the eyes. A full face mask covers the eyes, nose and mouth. 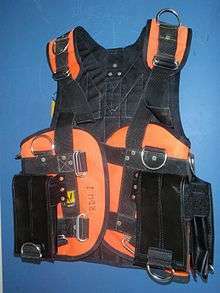 Diver's safety harness, to which a lifeline may be attached, including Bell harness, AR vest, Jump jacket. in some cases lift the diver out of the water. Shotline: A line connecting a shot weight to a marker buoy, used to mark a dive site and provide a vertical reference for descent and ascent. Buddy line: A short line or strap connecting two divers in the water, used to prevent them from being separated in poor visibility and for communication by line signals. Jonline: A short line or webbing strap to tether the diver to the shotline in a current. Surface marker buoy, which indicates the position of the divers to people at the surface. DSMB - (Delayed, or deployable surface marker buoy), which is inflated at the start of, or during the ascent, to indicate the position of the divers to the surface team, and as a signal that the divers are ascending. Knife to cut lines, nets or to pry or dig. Can also be used for personal protection against underwater predators if needed. However, this latter use is not recommended, as it is generally ineffective. Diver's net or line cutter. This is a small handheld tool carried by scuba divers to extricate themselves if trapped in fishing net or fishing line. It has a small sharp blade such as a replaceable scalpel blade inside the small notch. There is a small hole at the other end to for a lanyard to tether the cutter to the diver. Trauma shears. Very effective as a line cutter, with low risk of inadvertent injury or damage. Usually carried in a pocket or special purpose sheath. DiverGuard automatically inflates the buoyancy compensator if the diver stops breathing. Dry bag to carry items that must stay dry on the boat. Dive bag to hold equipment for travel. A jackstay is a line laid along the bottom to guide the diver during a search or to and from the workplace. 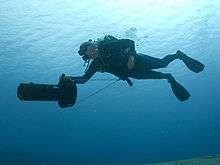 Lifting bags, an item of diving equipment consisting of a robust and air-tight bag with straps, which is used to lift heavy objects underwater by means of the bag's buoyancy when filled with air. Shot lines are used to identify the ascent and descent point and to help control rate of ascent and descent. Dive platforms (or swim platforms) on boats. 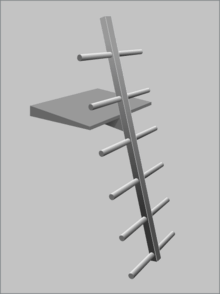 Boarding ladders, particularly the Christmas tree ladder configuration, with a single central rail and cantilevered rungs on both sides, which allows a diver to climb while wearing fins. Saturation systems providing surface support for saturation diving. 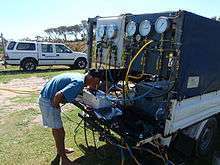 A hard-wired diver communications unit mounted in a waterproof box for convenience of transport and protection. ↑ Beyerstein, G (2006). "Commercial Diving: Surface-Mixed Gas, Sur-D-O2, Bell Bounce, Saturation.". In: Lang, MA and Smith, NE (eds). Proceedings of Advanced Scientific Diving Workshop. Smithsonian Institution, Washington, DC. Retrieved 2013-03-19.